I feel like I've been going full speed ahead lately. I just ordered a hundred or so art prints for the shop, so I've been gearing up to list those, we've been trying to get the nursery (and the rest of the house) ready for our little ones' arrival, and I've started the process of updating whatever paperwork we need to update so we'll have everything ready to go when we get a court date! Oh, and this week I'm watching my two favorite nieces in the whole world while my sister and brother-in-law get over a stomach bug. And a little bunting. It's hanging above the cribs until I finish the art for that wall, but it will eventually hang above the bookshelves. I think. Sorry for the awful photos, I guess that's what happens when an amateur tries to shoot inside late at night. I do like that you can see the cool shadows cast by the chandelier, though! Oh, and I'm still working on the site design. So please excuse the many changes and occasional mis-match in-progress color scheme! I would love a link to how to make the gutter bookcases those are so cute! It looks adorable! Did you know Layla from The Lettered Cottage is also planning to adopt from Ethiopia? I'm going to tweet her about you . . . maybe you guys can connect! I think the bunting will look adorable over the bookshelves. The room is coming together so nicely! 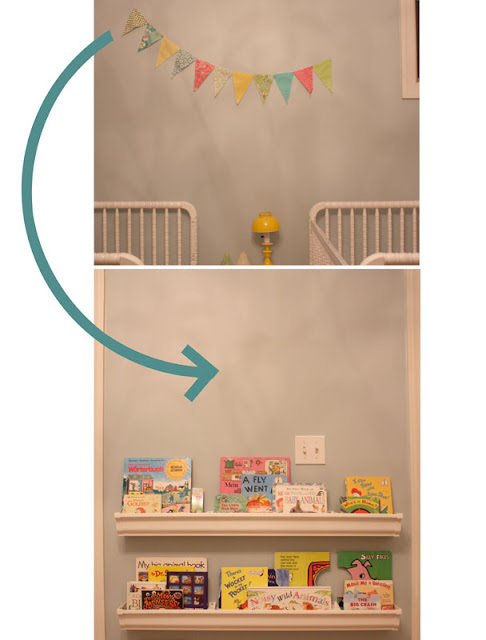 Those book cases are super cute. Maybe I can talk Ben into making some for us. If your little one come home in April it will be just in time for the arrival of our little one too. I'm so happy for you guys. Praying like crazy. Those gutter shelves are ingenious! I guess I'm behind the curve because I've never seen that before. love the gutter sheleves! what is the paint color on the walls? I am SO happy to have discovered your blog! It is wonderful! The gutter book shelves are great. Did you drill directly through the gutter into the wall to mount them? Yes, I'm loving the gutter shelves as well. How do you prevent sharp edges? 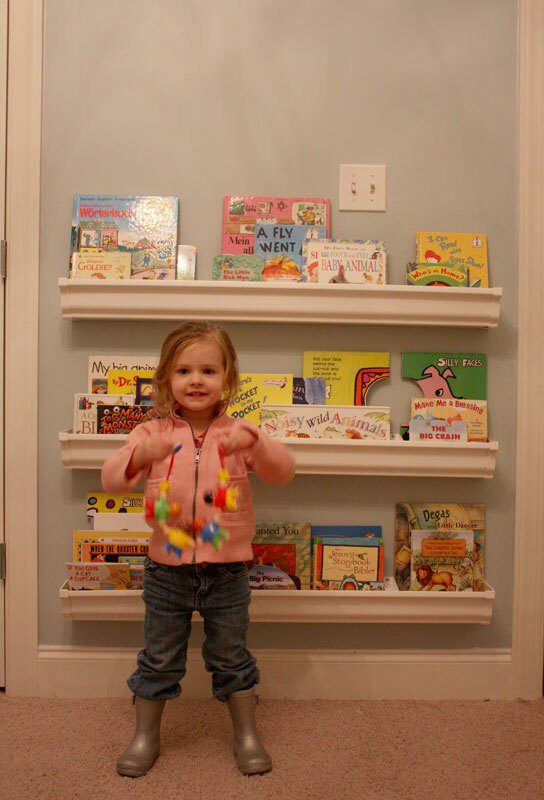 The gutter shelves - what a great idea! 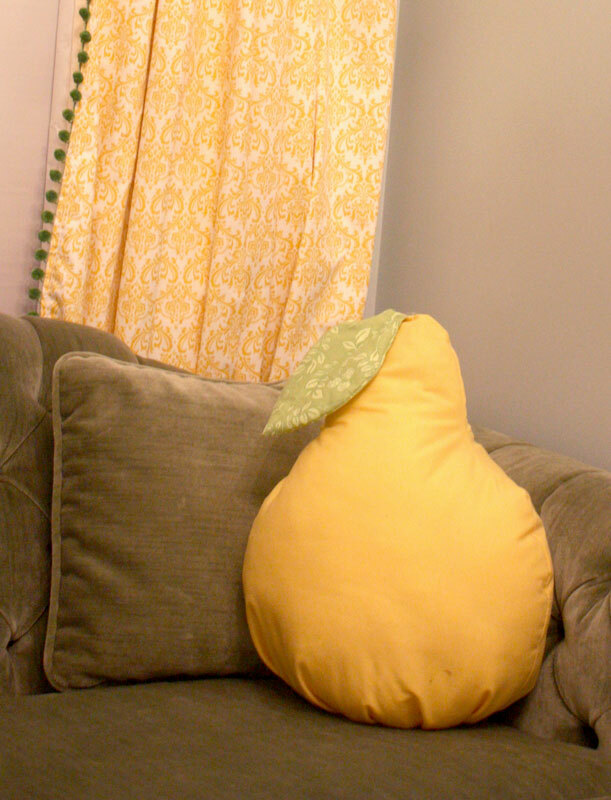 And that pear cushion is too cute. I too would love to see how you put the book shelves together. How cute and practical those are. Do you have to be careful about how much weight is on them? Please tell us more. Stephenie - I saw that they were adopting, but I didn't know that they had decided on Ethiopia. I'll have to stop by there and catch up! Thanks!